Peter F. Cowhey is the Qualcomm Professor of Communications and Technology Policy and Dean at the University of California, San Diego’s Graduate School of Global Policy & Strategy and CCST Board Chair. He is an internationally recognized expert on international trade and regulation with a special expertise in telecommunications and information policy and markets. Cowhey joined UCSD’s faculty in 1976 and became dean of IR/PS in July 2002. He was the director of the University of California system-wide Institute on Global Conflict and Cooperation (IGCC) from 1999-2006. He holds a B.A. in foreign services from Georgetown University, and a M.A. and Ph.D. in political science from the University of California, Berkeley. From 1985 to 1986 Professor Cowhey served as a member of the international planning group of AT&T International. In 1994 Cowhey took leave from UC San Diego to join the Federal Communications Commission as the Commission’s Senior Counselor for International Economic and Competition Policy. Later he became Chief of the International Bureau of the FCC and he led the Commission’s work in the WTO negotiations on basic telecommunications services and new competition rules for international telecom services (including the Internet). He has served as an adviser to major companies in the telecommunications and information technology industries and to leading international institutions. He is a member of the Council on Foreign Relations and is Vice Chair of the Board of the Grameen Foundation USA.. From 2010-2011 he also served as Senior Counselor to the U.S. Trade Representative on strategy and negotiations with a special responsibility for technology and intellectual property issues. From 2011 to 2012 he was the chief policy officer for the Aspen Institute’s project on the international digital economy and he also is the Chair of the CONNECT Innovation Institute. He was named to the CCST Council in 2007 and was named Vice Chair in 2011. He was named Board Chair in September 2018. 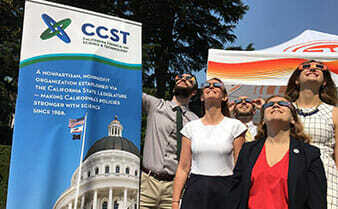 Science has a role in informing California policymaking and in sustaining the prosperity and wellbeing of our peoples and communities. California’s institutions of higher learning and its research labs have joined together to make their expertise available on a nonpartisan basis to assist the state government in making wise policy for the benefit of generations to come.